As a hypnotist, as a change artist, probably about 25-50% of the clients that I see come in because they want to quit smoking. They come in with this belief that smoking is physiologically addictive, that they're addicted to it. And why do people believe this? Why may you believe that cigarettes are physiologically addictive? Well, because the media, because tobacco companies have told you for years, and years, and years, and years, and years now as a masked form of hypnosis that cigarettes, that nicotine is indeed physiologically addictive. It's not. That's right. I told you it's not. And you're like, "Well, why can't I just stop?" Well, here's what we're gonna talk about today. You see, if smoking cigarettes, if nicotine was physiologically addictive, then you'd keep having to up the dosage, up the cigarettes over and over again. Let me give you an example. The alcoholic who got drunk or buzzed with a beer when at 15, or 16, or 17, now as a 50-year-old man, do you think he can still get buzzed off just one beer, one spirit? No. Yes, he'd just keep drinking more, and more, and more, and more, and more to get that same buzz as he did as a teenager. There is no glass ceiling. But the smoker generally finds their level, whether that be half a pack a day, a pack a day, hell, whether it's two packs a day. They seem to find their level and just kinda level out. Another example is the cocaine addict that's addicted to cocaine. Now, it used to maybe take half a line to get somebody high, and then it was a line, and it was two lines and three lines, and they had to keep upping, and upping, and upping the dosage, and they would chase as well. Cocaine addicts call it "chase the white dragon." They can never quite get that same high as they did from their first line, their first half-line, their first snort of cocaine. There is no glass ceiling, yet the smoker seems to find their level, again, whether it's half a pack, a pack, hell, whether it's two packs a day, and they kind of level out. The crystal meth addict, the heroin addict insert the terrible drug here. They keep having to up the dosage over, and over, and over again. They cannot get enough to get that same level as being high, yet the smoker finds their level, whether that be half a pack a day, a pack a day, hell, whether it's two packs a day, and they kind of level out. Smoke and nicotine is not physiologically addictive. I came in one day, and I was just in the casino, and she looked a little sad. I asked, "How's your day going?" She said, "Actually quite bad. One of my friends just passed away." I'm like, "Oh, I'm really, really sorry to hear that. What happened?" She said, "Well, she actually died from lung cancer." I'm like, "Oh, wow. Gosh, that sounds terrible. Do you mind me asking, like, roughly how many cigarettes would she smoke in a day?" She said, "Well, funny thing is that we started working here at the casino on the same day about 35 years ago, and the interesting thing is she never smoked, not even a puff of a cigarette, not even one." Yet 35 years of 5 nights a week passively inhaling that smoke into her lungs caused her to die, caused her to get lung cancer. So her body would rather kill her than ever allow her to get addicted to cigarettes before it ever even allowed her to pick up a cigarette. You see, if they were truly physiologically addictive, just smelling those Marlboro Lights night after night, she woulda went, "Oh my God, Marlboro Lights. Give me one." But she had that night after night for 35 years and never even had an urge to pick up a cigarette. Now, if cigarettes were physiologically addictive, then you wouldn't be able to choose when that crave, when that addiction hit you. Let me ask you, if you're a smoker and you're listening to this, when was the last time, as a smoker, you woke up at 3:00 in the morning just because you needed to smoke? Not because you needed to go to the bathroom and en route you're like, "Hey, you know what, I'd like to have a smoke now," but because you had to smoke, because your body was shaking, it was convulsing, you were foaming at the mouth, and you were willing to kill the person beside you, maybe the most beloved person in the world, to get a smoke. When have you ever experienced that with cigarettes? Never? The cocaine addict, the crystal meth addict, hell, the heroin addict, these people, these people can wake up at any time of the night, and they can have this uncontrollable urge of shakes, I've seen it in my office, foaming at the mouth, where they have to have that hit, because their bodies become so accustomed to it that if they don't have that hit they could die. So, here's the interesting thing. If a smoker comes into my office, I can tell them, "Stop smoking, stupid." If the alcoholic comes into my office, I'm not allowed to tell him that. If the crack addict comes into my office, I'm not allowed to tell her that. If the crystal meth addict comes into my office, I'm not legally allowed to say that. Why? Because you see, with some drugs, if you just stop cold turkey, your body could shut down, and you could die, because your body's become accustomed to the drug. Even some alcoholics have become so, so ingrained in drinking that alcohol that their body has become so accustomed to the sugar and whatever else is in the alcohol that if they were just to stop cold turkey they could die. So the extreme cases have to be weaned off these drugs or alcohol with some equally unpleasant drugs. 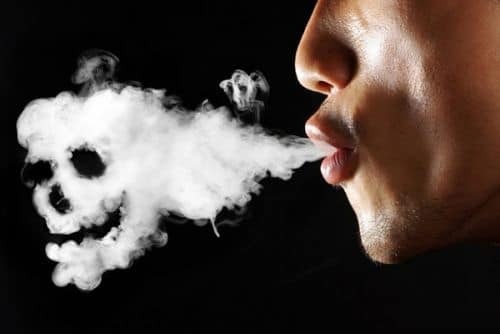 However, when was the last time you met someone or knew someone, perhaps yourself, and you just stopped smoking, or they just stopped smoking, and you heard they died the next day or the next week because they just stopped smoking? Never? No, me either. So I ask you, do you still believe that smoking is physiologically addictive? Now, now, you say, "Look, yeah, yeah, yeah. But I get grumpy, I get annoyed, I get angry, I get irritated, I get bored, I get upset, I get sad, I get depressed if I don't smoke." I'm not discounting that. I'm not taking that away from you. But guess what, all those things I just listed are what? Emotions. So, can you be emotionally addicted to cigarettes? Totally. Can it be a nasty habit to kick without the right tool? Absofreakinlutely. But are you physiologically addicted to it? No. The definition of being physiologically addicted to something is you can no longer physically function without having that in your system anymore, and you could die. You can stop smoking tomorrow, and you would not die. The interesting thing about smoking and with all the people I work with when it comes down to smoking is this. Smoking is very digital. It's either on, off. You either are a smoker or you're a nonsmoker. You're not somewhere in between. You're not a part-time smoker. You either smoke or you don't smoke. It's not analog. It is not a sliding scale. You either are or you're not. So, oftentimes when people come to see me, it really does come to the point where they just make that commitment. Do you want to stop this? And once they've made that commitment in their mind that they truly want to stop, then the work I do with them, and, quite frankly, to any kind hypnosis, is quite easy, because you're in the place. They're in the place they need to be to make that change. They've already flipped that switch to off inside their head, and they just need a little bit help, a little encouragement on that track. However, if you haven't flipped that switch, if you have no intention of flipping that switch, hypnosis, neuro-linguistic programming, the work, cognitive behavioral therapy, patches, gum, none of it's gonna help you. God Himself, if such a man exists, coming down with a magic wand, doing some hocus-pocus, isn't going to make you a nonsmoker if you haven't made that commitment to yourself. And the commitment has to be for you, for the smoker. It has to be that you wanna quit. Can other people benefit from it? Totally. Whether that's spouses, whether that's children, whether that's parents, friends, colleagues, yeah, totally they can benefit. But it has to come from you, the smoker. You have to want to stop. I've lost count of the amount of times that people have called me on behalf of a partner, of a spouse, of one of their children, of one of their parents, and they're like, "Can you make my mom, dad, son, daughter, husband, wife, lover, boyfriend, girlfriend stop smoking?" I'm like, "When your friend, lover, husband, boyfriend, you know the deal, wants to stop smoking, give them my number, and I'd be delighted to have a chat with them. But until they're ready to make that call, I totally appreciate you giving me a call, but until they're ready, there's nothing I can do. So, give them my number, and when they're ready, have them contact me."